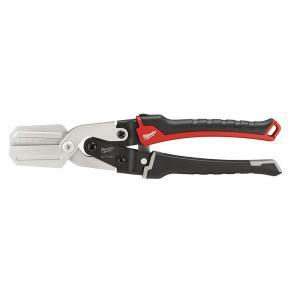 The Milwaukee 5-Blade Pipe Crimper provides deep, consistent crimps in up to 22 Gal. Cold rolled steel. The patent-pending reinforced crimper ribs add stiffness to each blade for aggressive crimps. Patent-pending 1-thumb open and lock mechanism makes the tool easy to use while over mold grips increase tool durability. Rust resistance and a heavy duty spring ensure the tool will survive jobsite conditions. Tbook.com crawls the web to find the best prices and availability on Crimpers and related Tools and Hardware products like Milwaukee 5-Blade Pipe Crimper. For this page, related items include products we find that match the following keywords: "Crimper" at our vendor partner Home Depot. Milwaukee 5-Blade Pipe Crimper is one of 41 Crimpers and related products listed in the Tools and Hardware section of Tbook.com If you have any questions on this product, please give us a call at 734-971-1210 during the hours of 9am - 5pm EST for assistance. Thank you for shopping at Tbook.com, the Internet Department Store!